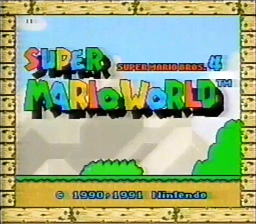 Super Mario World is the first Mario game on the Super NES, rushed and hacked together in time for release. There is an unused sound in the ROM. It was reused in the next game for Expansion Blocks...well, expanding. A gigantic number of unused graphics and objects can be found hidden in the ROM. 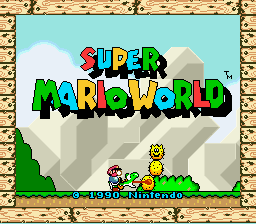 Even more stuff from earlier builds of Super Mario World can be found in the SNES Test Program and SNES Burn-In Test Cart. A classic Piranha Plant. If you've ever played a Mario game, you should know how this works. 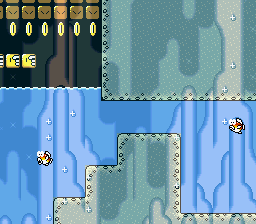 Its vine tile has been replaced in memory with one of the frames of Cheep Cheep flopping around on land, using the red palette instead of their normal yellow palette. Note that the upside-down variation of this is used in Vanilla Dome 3, but its stem has been made tileset-specific to the Cave object tileset, and since both Piranha Plants share their stem tilemaps, this explains why the stem of this has been moved. An unused, yellow upward facing Piranha Plant variant was shown in a prerelease screenshot however. There is in fact code in the game to make the stem use the same tiles as the upside-down variation, but due to a bug, it doesn't work properly. There is an Asar patch to correct this problem. A duplicate of the normal Chargin' Chuck, used nowhere in the game. This object will spawn a bunch of Swoopers at whatever Y position it's placed, acting much like the Boo spawner found in Ghost Houses. 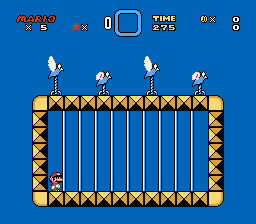 These Swoopers cannot be defeated and will hurt Mario if he tries jumping on them. Note that one of their two flying frames has glitched graphics, hinting that Swoopers had a tilemap change at some point in development, and the fact that jumping on them deals damage hints that they may have once been something completely different. It should be noted that the Swoopers spawned by this object have a completely different palette than the ones used in-game; a blue and red palette is used instead of the green and orange one used by the normal Swooper objects. Curiously, later games would use the alternate coloration for Swooper, meaning that this may have been the intended palette after all. These platforms are like the checkerboard platforms, but their sizes are 3 × 2 pixels. Like the other spawners, this one spawns Eeries. You probably already guessed that. A sprite that causes Layer 2 to fall. It also disables horizontal scrolling. Unknown use. A horizontal rope platform resembling those found in the mountain tileset, only this one isn't tileset specific. This shares its object ID with the 16x16 cloud platform. Question Mark Blocks that contain Koopa shells are fully coded in the game! Well, not just a Koopa shell. 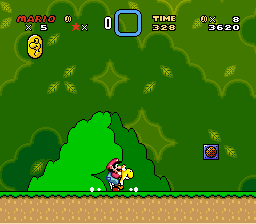 The actual Koopa is still inside, and it will get back up if you wait too long. Unlike a normal shell, fireballs have no effect on it. This is because items from blocks or the reserve box are immune to fireballs in order to prevent the player from frying them. 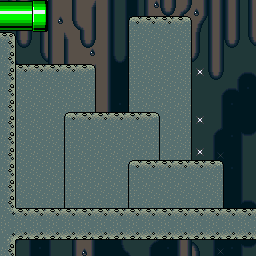 These blocks aren't activated by Koopa shells or jumping, but by running into them from the side. They are finished, but the object part of this block uses the wrong graphics (hinting that something else other than the P-Switch and Springboard was here). This graphical error can be fixed by changing the two 0x03 bytes at PC address $0729A to 0x00. Two versions of this block are coded: one with nothing in it, and one with a Cape Feather, the latter turning into the former when hit. 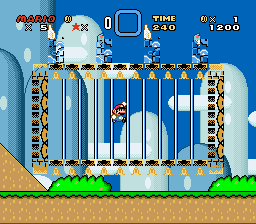 Similar blocks appeared in Super Mario Bros. 3. These logs are bright yellow, and can be both horizontal and vertical. Side cloud fringes. Used nowhere in original game. Cloud fringe inside the white tile. 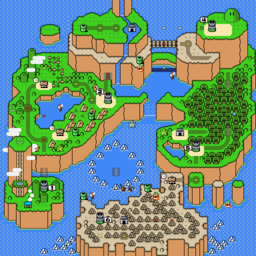 Three Koopalings are actually present on the overworld map, but are never visible; the path tiles that were originally supposed to make them appear were changed into oddball corner tiles and used in the Star World. 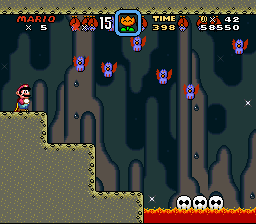 Unlike the rest of the overworld sprites, these actually had a purpose – they were to drag you into levels, much like the hands in World 8 of Super Mario Bros. 3. A small musical note sprite, that bears a resemblance to the one on Note Blocks. In later games such as Super Mario 3D Land, notes like these pop out of Note Blocks when you jump on them, so maybe the same was planned for this game. In the graphics set for the forest enemies like Wiggler and Lakitu, is this small circular object. While there isn't any way to completely verify this, it does seem to resemble a chain that would be used for a Chain Chomp enemy. Given that the Chain Chomp was originally intended to make an appearance, and that there is an unusually large amount of placeholder tiles in the forest enemy graphics, it is entirely possible that the Chain Chomp was dummied out late in development, and this single tile was forgotten. 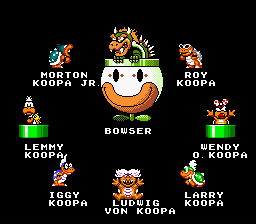 A tile version of the teardrop that appears when damaging the Koopa Clown Car. In the final game, it is a sprite that animates slightly and uses a blue palette, so this static tile version ends up unused. 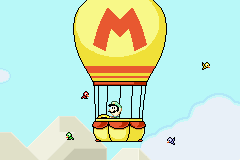 The birds found atop Yoshi's House have two unused flying frames. While these were left unused in the original game, the tiles found a purpose in the Game Boy Advance remake during the 96 exits cutscene, and as part of the reward for completing the coin-collecting challenge in Donut Plains 1. Just the word "AND". This could have been meant to appear in the copyright line, e.g. 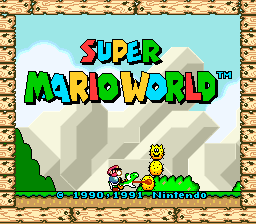 "© 1990 AND 1991 Nintendo", though it doesn't fit well with the existing copyright font. There's a pipe in Vanilla Secret 1 that leads to a secret exit. In the screen right above that one, there's warp data that takes the player to the same exit. This was done to fix a bug with the secret exit pipe: if Mario enters the pipe while riding Yoshi, he'll be just high enough (by a single pixel!) to be on the next screen up. 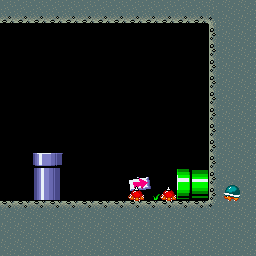 Instead of just, say, moving the pipe down a block, they instead duplicated the warp pipe data. The Game Genie code DDA6-DF07 enables a free movement/instant flight mode. Hold L and press A once, and you'll be able to fly (provided you have a cape) as soon as you start running. Hold L and press A again, and you will be able to move Mario anywhere in the stage. Hold Y to speed up Mario's movement, or press L and A again to return to normal gameplay. This was removed in the European version. Additionally, if you go past the seventh and final "defeated Koopaling" scene, you can view the credits. The Game Genie code EDA5-0F6F enables a power-up select not unlike Super Mario Bros. 3. Hold Up and press Select to switch between Small, Big, Cape, and Fire Mario. This was removed in the European version. The Game Genie codes DDC1-64DD DDC5-6DAD allow you to instantly complete any level, even ones you have not already beaten. Press Start then Select to complete the level via the "normal" route, or hold A or B while pressing Select to complete the level via the secret goal, if the level has one. 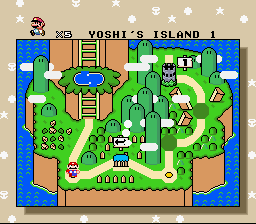 The Game Genie code EDB7-0FBD allows you to reach Star World from Yoshi's House. 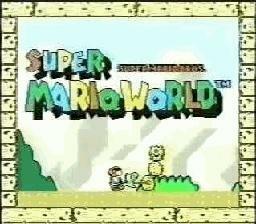 Press Select while on Yoshi's House to be transported to Star World 1. The Game Genie codes 0ABB-6D9D CEBB-6DBD B4BB-6D2D allow you to walk on not-yet-revealed paths and enter not-yet-revealed levels. However, you cannot pass through locked doors. 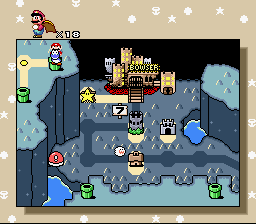 Super Mario World has a little-known category of secrets, where having Mario touch four invisible and silent trigger points in a level in the correct order will cause a 1-Up to spawn. The only way to discover these in-game is to stumble across them by chance (some are much more obscure than others), but Lunar Magic's level editor will show their locations on maps that include them. These hidden 1ups are from Extended object of 19-1C. However, less widely known is that Big Boos also have this behavior, but they require you to wait for approximately sixteen seconds before they'll react (by peeking out from behind their hands). This frame does not appear to be used anywhere else in the game. This page was last modified on 27 March 2019, at 08:31.